For other uses, see Huainan (disambiguation). Huainan is a prefecture-level city with 2,334,000 inhabitants in central Anhui, China. It is named for the Han-era Principality of Huainan. 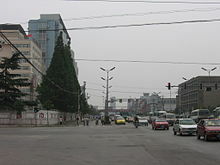 It borders the provincial capital of Hefei to the south, Lu'an to the southwest, Fuyang to the west, Bozhou to the northwest, Bengbu to the northeast and Chuzhou to the east. Huainan is one of the core cities of Hefei Metropolitan Circle and is known for its coal industry and thermal power plants. Its built-up area is home to 1,938,212 inhabitants in 2010. Its city flower is the Chinese rose (Rosa chinensis) and its city tree is the Old-World Plane Tree (Platanus orientalis). It is also considered to be the hometown and birthplace of tofu. The prefecture-level city of Huainan administers seven county-level divisions, including five districts and two counties. These are further divided into 66 township-level divisions, including 24 towns, 23 townships and 19 subdistricts. The urban centre is located on a plain on the south bank of the Huai River, bordering Gaotang Lake on the east and forested hill area on the south. To the west are Bagongshan District and Shou County. Huainan is a major production center for coal, with an output of 43.28 million tons in 2006. The city hosted the 17th China Tofu Cultural Festival on September 15–17, 2010, including the National Bean Products Exhibition. East of the city a bridge crosses the Huai River, shared by the Fuyang-Huainan Railway and highway S225. Near the city centre, a ferry provides connection to the (rural) north bank of the Huai River. ^ William Shurtleff; Akiko Aoyagi (May 2013). History of Tofu and Tofu Products (965 CE to 2013). Soyinfo Center. p. 55. ISBN 978-1-928914-55-6. Wikimedia Commons has media related to Huainan.